When I started my first personal blog in 2010, all I cared about was my daughter. She was a few months old then and I was a very young first-time mom. I was working from home so my world revolved around breastfeeding, changing diapers, and working on an old laptop. It was both exciting and exhausting so I created a private blog as an avenue to write about those times. Blogging for me was merely a personal diary at that time, until I joined our local Cebu Blogging Community (CBC) last year. Things changed as I enjoyed reading other blogs and learned more about blogging. I realized that there’s more to sharing your own stories. That blogging is about engaging and building connections in the online community while sharing posts that would help promote social good at the same time. But since I was available on the scheduled date and I really intend to learn more about blogging, plus it was a free event sponsored by Diamond Suites and Residences, I decided to join. The event was held last March 7 and my experience was absolutely better than what I expected. First off, because of the venue’s easy access, I got to the event a little early (Yey!). 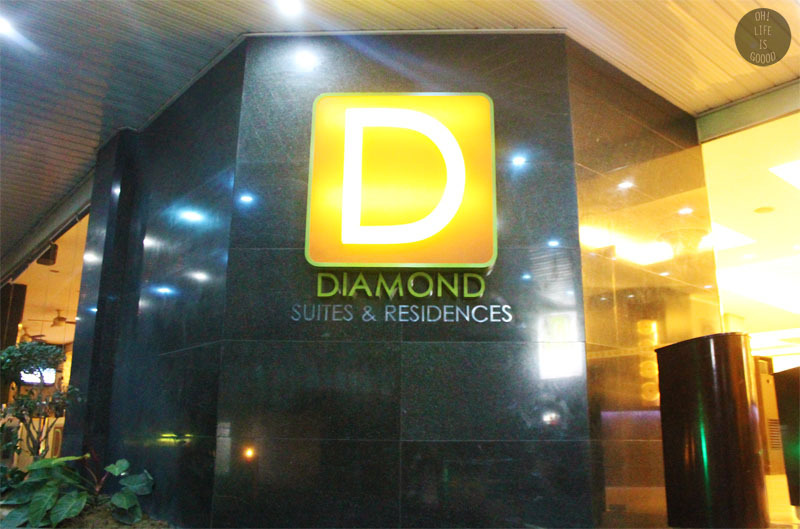 Diamond Suites Cebu is conveniently located along Apitong Corner, Escario Street.. just a walking distance from Ayala Terminal. We even had a room tour..
And did I mention about the Pool Party? Pool + Food + Music + Roof deck = AWESOME! My heartfelt thanks to Cebu Blogging Community for welcoming me last year and for this great experience! 🙂 A huge thanks to our event sponsors for making the whole event possible: Diamond Suites and Residences Cebu for our cool venue, good food, and wonderful service; Flawless Face & Body Clinic for the raffle gifts and vouchers; Cebu Teambuilding Services; Cebu Domain; and Philippine Information Agency (Cebu). Brilliant! I love blogging communities who think nothing but to help fellow bloggers, too. 🙂 Cheers to us! After 4.5 years of blogging, I've attended my fair share of bloggers get-togethers already and most of them are really fun. I've never attended one with a pool party though. Haha! Glad you had fun! This is inspiring. I want to take my blogging to the next level too. That's good to know how one event somehow made you start to blog. For sure, it's one of those moments you'll be forever thankful for. Hehe Yeah, how I wish I can be in Manila soon. It's really nice to meet people who share your passion for blogging. CBC seems to be an exciting group. Glad to hear you had fun at this event. looks like so much fun!!! im so in need of a party esp in a pool right now! I'm really envious about this event. I already signed up to become a member of CBC but I haven't heard a word from them. 🙁 I hope they accept me – at least I get to have some affiliation with a group I can actually see (on a regular basis, I hope). That seem to be a lot of fun. I sure hope could belong to a gathering like that. Meeting other bloggers makes blogging more fun 🙂 Here's to blogging communities, may all our blogs prosper and may we be good social movers of the country. Yay! I love attending blog events and meet fellow bloggers i usually meet online. It's so refreshing to match the faces with the blog name. 🙂 Looked like you all had fun. Wow! You have your own meet up there! So nice! Been to Cebu and I miss it a lot. I wish I was able to go around, but I came there as a sessionist for a semi-popular band that time and we had to be ferried around in a van and had limited tour. 🙁 will look up Diamond hotel when we go there. This was a fun read! I remember when I attended my first BDJ event in 2013 and everyone was nice. I wasn't a blogger then but because of the friendship I made, I was encouraged to start. 🙂 Shout out to the awesome Rochelle Rivera and Mizi Sarte – the first bloggers who encouraged me to start my own. I hope to meet you one day in an event here in Manila, Mommy Rose! 🙂 God bless you! Wow, this is great! You guys sure had fun with other bloggers from Cebu. At least, bloggers everywhere are also as active as the ones in Manila.